Azamara Cruise Barcelona to Rome includes five late nights on beautiful Mediterranean islands and an overnight stay in fabulous Amalfi. A late night stay on Ibiza gives you ample time for the beaches and sizzling international nightlife and clubs. In cosmopolitan Palma de Mallorca you’ll want to shop, visit the majestic cathedral, and wander the charming old quarter. Explore the ancient citadel and old town maze of streets in Bonifacio, and take a day trip to the emerald waters and gorgeous beaches of Costa Smeralda while in Sardinia. In Trapani, ride the cable car to Erice, a town clinging to cliffs thousands of feet above the sea, and be sure to visit the stunning Greek ruins of Segesta. On top of all these pleasures, you’ll have three full days to explore the cliffside towns of the Amalfi Coast and lovely Capri. It doesn’t get any better than this. 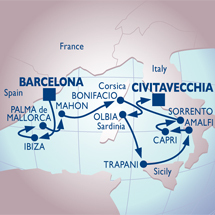 Call 800-227-1577 for the lowest price Azamara Cruise Barcelona to Rome.